I really needed a change from reviewing my ever increasing backlog and do something else for a while. I saw on another blog that someone was doing up a series of articles on the worst anime ever made and asked readers for suggestions. Naturally the suggestions in the comments were pretty piss poor. People always conflate truly terrible anime with shows they just simply don’t like ("Wings of Honneamise" ain't the worst anime made kids). Plus the blog author bizarrely limited the choices to TV series, not OVAs or movies. There aren’t that many truly terrible TV series to begin with. I thought I could do better (heck, a lot of people could) so I’m going to have a crack at writing up a series on truly terrible anime myself. I hope to do one review per month, but of course that’s probably not going to happen. First up is the movie version of “Nadia of the Mysterious Seas”; set three years after the conclusion of the TV series, we find Nadia living in London and working as a cadet newspaper reporter for the Planet Times. Nadia plans to make herself fully independent before returning to France to live with Jean. However the editor really has no intention of letting her report on any stories and only has her making tea for him. The biggest news sweeping the world is that several world leaders and top ranking military personnel have mysteriously vaporised into clouds of steam. Because of these strange occurrences and other tensions throughout the world, the globe on the brink of a world war. Meanwhile Jean has returned to his home in Le Havre, France where he continues being an inventor with a bicycle repair business on the side to make ends meet. One morning on the beach, Jean sees a young woman washed up on the rocks. He immediately takes her back to his home and nurses her back to health. She eventually awakens but for some reason can only remember her name, Fuzzy. Meanwhile back in London, the prime minster disappears in a puff of steam while watching a play at the theatre. The reporters and editor rush out to get the story leaving Nadia to mind the office. The phone rings and Nadia answers. On the other end is a man clamming to know about the recent mysterious evaporations. The man on the other end is doubtful that she is a journalist; however he arranges a meeting with her that night in a local pub as he is being followed. While deciding to whether or not to enter the rather dingy looking pub, the man suddenly appears and drags Nadia down an alleyway to talk with her privately. He introduces himself as Frei and immediately recognises her as Princess Nadia. Nadia asks who he is. He admits he worked for Neo Atlantis and later worked for a new organisation which he has now betrayed. He gives Nadia and envelope of documents, but before he explains what they are three men in trench coats appear and try to capture the pair. Frei shoots one of them who vaporises just like the recent cases with world leaders and military men. A scuffle ensues with Frei being shot and killed and Nadia being captured. However Nadia manages to escape. She takes one of the documents from the envelope and hurriedly posts to remainder to Jean in Le Harve in a nearby post box. The next day Nadia researches the man who wrote the document she kept, Dr Albert Whola. Apparently he was working on some form of new energy that he discovered inside all living creatures. This energy is used by all creatures living throughout the cosmos. Whola had to abandon his research after he was ostracised by the scientific community from pressure from religious leaders. He disappeared soon after along with his daughter Fuzzy. Nadia then discovers that Whola’s research was used to create robots which have replaced most world leaders and top military brass. She takes her findings to her editor who immediately dismisses it. However the owner of the paper intervenes and asks Nadia to come to his office to discuss her story. Nadia thinks she’s cracked a big story and will finally be published as a lead story, but instead the owner shoots her with a tranquiliser dart. 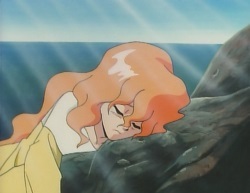 Nadia awakens to find herself inside a Neo Atlantean submarine. 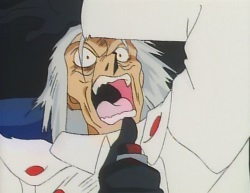 A white haired man enters and introduces himself as Geiger, an ex-member of the defeated Neo Atlantean group. He tells Nadia that he plans to send the world towards annihilation via a world war. He has asked Whola to create robots of world leaders and top military personnel in order to make this happen. Geiger asks Nadia where the documents she took from Feit are. She refuses to tell them, however Geiger suspects she sent them to Jean. Back in Le Harve, Jean returns home to find a group of people attempting to abduct Fuzzy. It’s the Grandis Gang who are now freelancing for Geiger. Jean is knocked out and the gang attempt to find the documents that Nadia sent him. But they soon give up after searching and decide to take Fuzzy anyway to claim thier money from Geiger. Jean later awakens and finds the documents Nadia sent him in his mail box. Realising that Nadia is in danger and wanting to recue Fuzzy, he sets off for London. This film is nothing more than a terrible and cynical attempt on co-producers NHK and Toho’s part to quickly cash in on the success of the original “Nadia of the Mysterious Seas” TV series. Released only two months after the TV series finished broadcast, it’s obvious that the production was rushed and not well thought out. According to the article on Japanese Wikipedia, apparently Gainax (who produced the original TV series) was set to produce the movie as well. However by the 22nd episode of the series, director Hideaki Anno had already left the project (Shinji Higuchi directed the remaining 17 episodes) as he was completely burnt out. NHK and Toho Pictures realised that Gainax could not be counted on to make the film, so made their own independently from the studio, handing production to Group TAC and Korean animation studio Seiei Animation. The resulting movie did not have any input from any of the key creative staff of the original series. 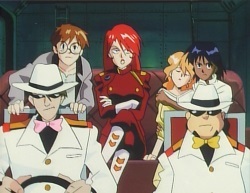 The film’s staff only had tenuous links to Gainax; the director of this film, Sho Aono, was an episode director for one of the latter episodes of the TV series. Screenwriter Kaoru Umeno also did several scripts for the TV series, but not much else of note in her short career. This film also seems to be Kouichi Takada’s only character designing credit. He mostly does storyboards for a living. As a result, this film only barely has any real connection between it and the end of the TV series. Worse still is the 25 minute recap of old animation from the TV series which appears only five minutes into the runtime of the movie. According to Japanese Wikipedia, Gainax edited the 25 digest for the film. I’m not sure if this is really true. The digest is pretty much near incomprehensible if you hadn’t seen the TV series in its entirety. The digest not only highlights the fact the story in the TV series was much better, but the animation was also far superior, and even the animation from the much maligned “Island Episodes” is shown to be several notches above this film. There’s a lot of off model animation and quite a lot of shoddy camera work with slightly out of focus shots and shadows between the cels and backgrounds. It’s most certainly not theatrical quality animation. The story is pretty silly as well. How the remnants of Neo Atlantis survive is of course never explained. The science behind Dr Albert Whola’s robots is also never explained. Why would his robots just up and evaporate into steam? And of course that stupid light sabre thing the robots stick in their ear when they communicate with Geiger is just dumb. The science behind the mysterious cosmic energy in all living creatures is utterly silly gobbledygook that doesn’t make one iota of sense. The girl named Fuzzy (an utterly daft name) and besides serving as a link between Nadia and jean, her role in the film is pointless in the end. Why would the Neo Atlantean’s recover her if her father sent her way, helped by one of the Neo Atlanteans cohorts? To top it off the new characters, especially the sub-characters look awful. It just seems not a great deal of effort when into designing them. And the animators really massacred them as well. It’s patently obvious that Toho and NHK didn’t care about the end product. It just feels cobbled together with little thought or care. Believe it or not, this film was screened in theatres with a live action version of “Video Girl Ai”. Admittedly that live action adaption doesn’t seem too bad when compared with this film (at least from the first 20 minutes I’ve seen of it). 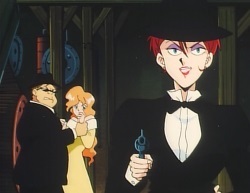 Like “Video Girl Ai”, the movie version of “Nadia of the Mysterious Seas” has been long forgotten by Japanese anime fans. While a couple of artbooks were released to cash in, the film itself only got VHS and laserdisc releases and was never reissued on DVD or Blu-ray. However outside of Japan, the film has been released on DVD in Germany and France. In 2002 ADV Film released and dubbed the film for a DVD release, however didn’t reissue it on Blu-ray when Sentai Filmworks released the TV series on Blu-ray, possibly because it was never remastered in high definition. The long out of print ADV Films DVD does contain a creditless ending and the original opening credits (the DVD has overlaid English credits on the feature), but nothing else in terms of extras. I must note at this point that the film is only subtitled "The Secret of Fuzzy" in Europe (despite what some English sources say). 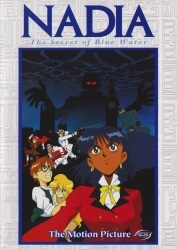 The Japanese title is the unimaginative "Nadia of the Mysterious Seas". There are a couple of bright spots in the film; the climax is reasonably well done and the end theme song, “My Precious Trick Star ~Yasashisa o Kureta Anata e~” performed by Silk (Kinuko Oomori’s band), is great. Other than that, it’s a completely mediocre film. It’s poorly scripted, designed and animated waste of space. It’s what happens when producers do not care about the product and only want to make some quick bucks off a profitable franchise. You couldn’t even recommend this one for diehard fans of the original TV series. Admittedly this probably wasn't the best film to kick this series of blog posts off with (as it’s more highly mediocre than really awful), however don’t fear. I have a large list of truly bad anime that I will be subjecting you to over the remainder of the year.